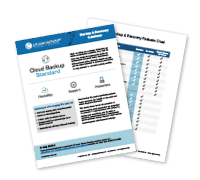 Cloud Backup Standard gives you full flexibility in how, when and where you protect your bare-metal and virtual server data. Our Standard solution gives you the ability to customize recovery points and retention periods, all with unlimited software licenses. We also provide assistance with configuring backups and restorations. It also includes direct integration with Microsoft Exchange and Active Directory to protect your business applications. Note: All our phoenixNAP backup solutions are tailored to your specific backup and restoration needs. Contact us to compare our prices against Mozy, Carbonite and Barracuda quotes.